What Is The Biggest Song Writing Mistake That Holds Back The Majority Of Songwriters From Reaching Their Full Potential? The biggest mistake that most Songwriters make is they try and write music or lyrics using self one instead of self two. This means that they use their "conscious self talk" to try and "piece together" a song. They may say, "ok, I begin with this chord, so what can I do next?" "Well, I know that this chord will work with that one, so let's try that". "Ok, so now I have a verse, I need some to follow it up with some kind of chorus. What chord progression can I use that will fit as a good chorus?" Basically these songwriters take the "rules" of music and try and use self one to piece things together like a puzzle. Said another way, they try and "think" their way through their song writing by using what they "know" about music. If it doesn't sound familiar, then good. You're already on the right track! So why is it so bad to try and use self one to create music? The most important reason is that the majority of your songwriting potential doesn't exist in self one. Your creative "genius" exists in self two. By trying to use self one to create music you won't even be scratching the surface of what's easily possible for you with self two. Here's a small piece of information that illustrates this important point. Scientists has discovered that this "talking in your head" (self one) uses around 40bits of processing power per second. Compare that to the processing that self two has at it's disposal which is estimated to process around 10 million bits of information per second. If you can learn to let self two drive your song writing process, you will put yourself WAY ahead of 99% of songwriters. The vast majority of songwriters have already accepted only what their conscious mind or self one can create for them. When you open yourself up to self two you will be using resources far more powerful than the vast majority of songwriters. … their self two to drive the whole process. Also keep in mind the formula that we discussed recently. As you can remember, self one is the interference that prevents you from your full potential. So trying to write music and lyrics with self one is actually trying to create something with a tool that usually does more damage than good. Instead, you need to rely on self two to do the creating. Self two is a deep resource. It contains knowledge and information about all the music you've ever listened to... Everything you've ever learned about music… In fact, it contains everything you've ever learned about anything. This is the type of miraculous resource you are drawing on when you invite self two to do your song writing, and it's not hard to do when you know how. The biggest obstacle in letting self two into your life and allowing it to "take over" is the issue of trust. The thing is: self two is unconsciously driven. This means that when you let self two "take over" from self one, you will not have conscious control anymore. To allow this to happen requires you to trust self two. 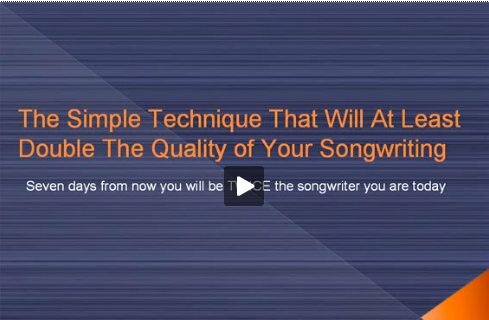 If we take a look at some quotes from some very well known songwriters and composes, it becomes obvious that these musicians are allowing their unconscious resources to direct their songwriting process. In these following quotes, you will notice that these musicians don’t know exactly where their musical ideas come from. This is a sign that they are creating with their resources that they are not aware of… their unconscious resources or their self two. Let’s take a look at the quotes. Also, pop songwriter Michael Jackson talks about creating entire songs in his dreams, which is a big sign that the ideas are created by his unconscious resources. So the next question is, if trust is the key to releasing self two, how can you build this trust so self two can control the music you create? The easiest way to build this trust is to simply practice some of the exercises that invite self two to "take over". Once you’ve accumulated some personal success, confidence in self two will quickly grow. In the next part of this six steps to song writing success you are going to learn how to unleash self two, the master songwriter that exists within you.